Even before the start of World War II, the engineers at General Motors realized that the 30’s Cadillac V-8 needed to be improved. It was the dawn of the horsepower era in Detroit, and the L-head V-8 design had maxed out its ability to produce more. It had been reliable for its day, but despite an attempt to redo the heads for higher compression, the point of diminishing returns had been reached and it was time to move on. Post-war, the engineers at GM were ready for the challenge, and their design set the pace for engine performance for years to come. It’s fitting that when the one-millionth Cadillac rolled off the Clark Street assembly line on November 25, 1949, the new overhead valve V-8 powered it. Though this milestone car was the last Cadillac of the Forties, it was, in reality, a car fully poised for great success in the Fifties. In November of 1949, Motor Trend magazine named its very first “Car of the Year”, with the field narrowed down to Ford, Oldsmobile, and Cadillac. 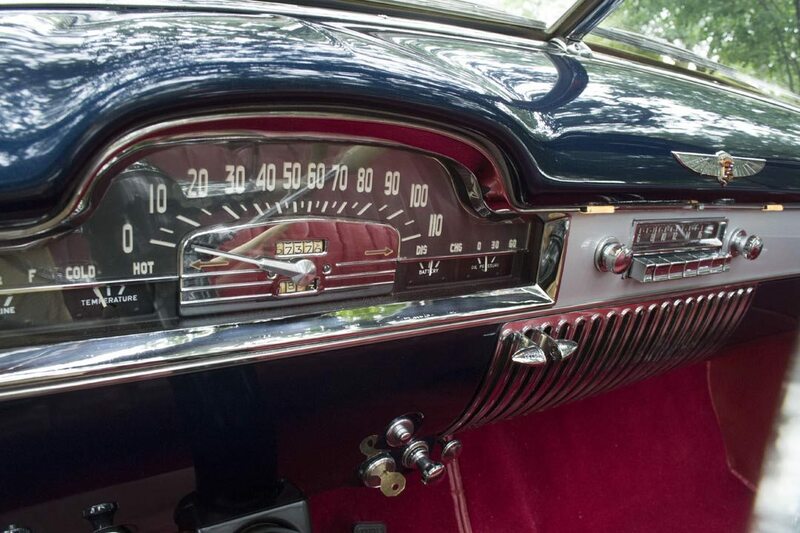 Ford was eliminated first, caught a little flat-footed in 1949, and although similar, the Cadillac V-8 developed nearly 20 percent more horsepower and weighed less than the Buick engine, making the Cadillac the obvious choice. From that moment forward, Cadillac sealed their position as the premiere American luxury brand for the next 3 or 4 decades. 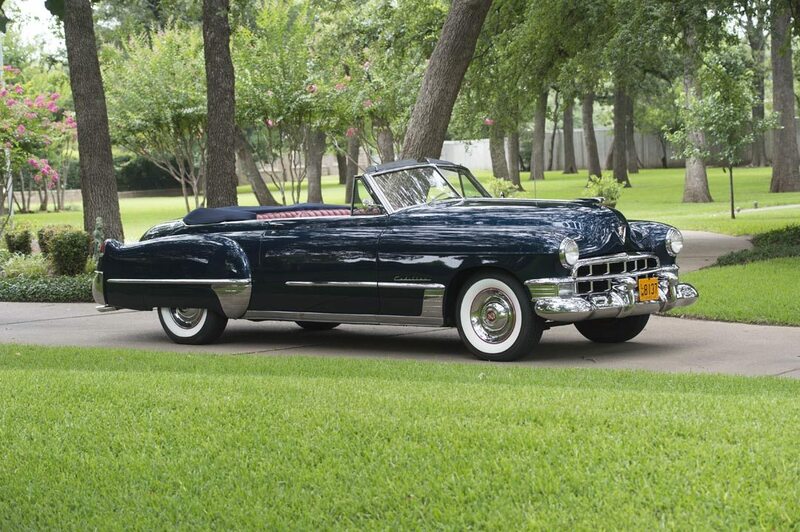 Of the four models offered by Cadillac in 1949, the Series 61 and 62 cars were a great sales success, and identifiable by minor trim variations. The higher-priced Series 62 cars feature a few more styling details, including ribbed front fender stone shields and bright rocker panel moldings. 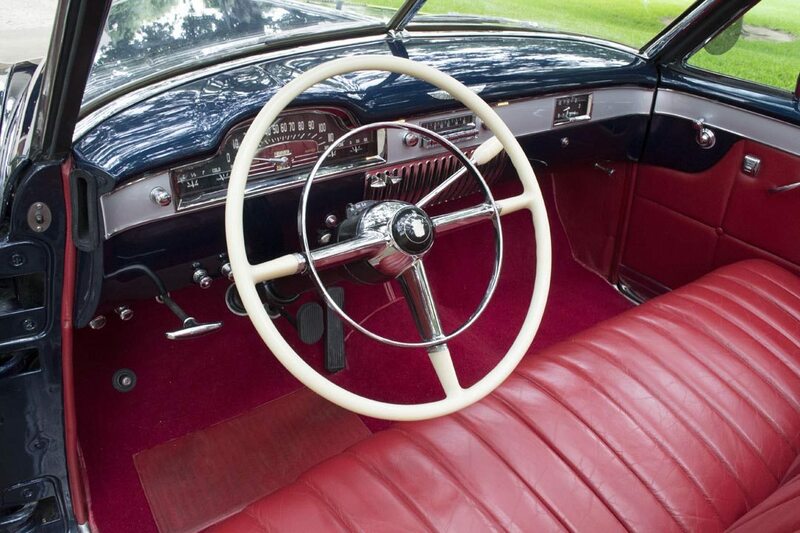 The hood line was stretched and the goddess ornament moved forward, providing the GM stylists an even longer, sleeker look to work with, and just over 8,000 examples of the Series 62 Convertible Coupe rolled out of Detroit in 1949. The big news, however, was out back, where the first sign of the iconic Cadillac fins showed up, with the integrated taillights making the whole car appear lower. 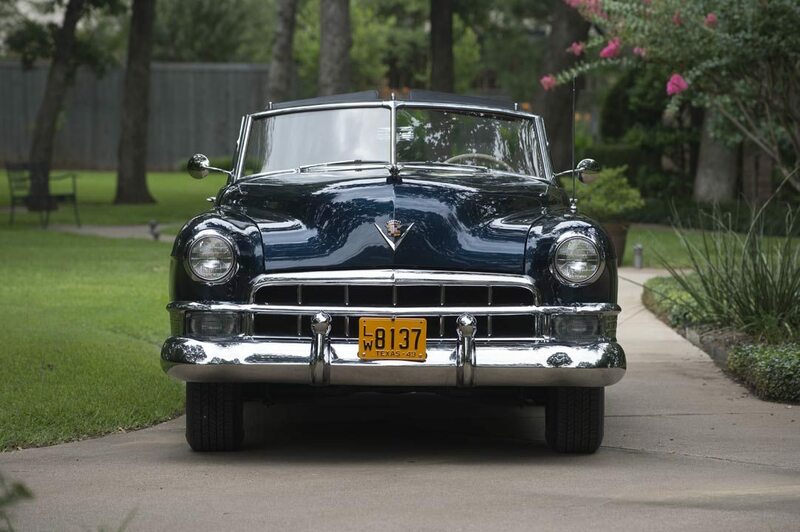 Residing in a fine Texas collection since 2005, it was a very straight, original car when restoration began that year. The stunning results were crafted by Richard Hellbusch, an award-winning restorer from New Braunfels, TX. The car was stripped, blasted, and beautifully refinished in a lovely iridescent Antoinette Blue. The original chrome, glass, and stainless trim were all refurbished and replaced back on the car. Inside, a lovely new red leather interior was installed that remains soft and supple, and is in stunning contrast to the blue Haartz cloth soft top. The interior features one of the all time great dashboards in Cadillac history, highlighted by real wood trim and tons of chrome. This car is equipped with power seats, AM radio, and power windows, and has covered just under 68,000 miles since new, and just 500 in the past decade under the stewardship of the current owner. Under that long hood, everything mechanical is original to the car and beautifully restored. 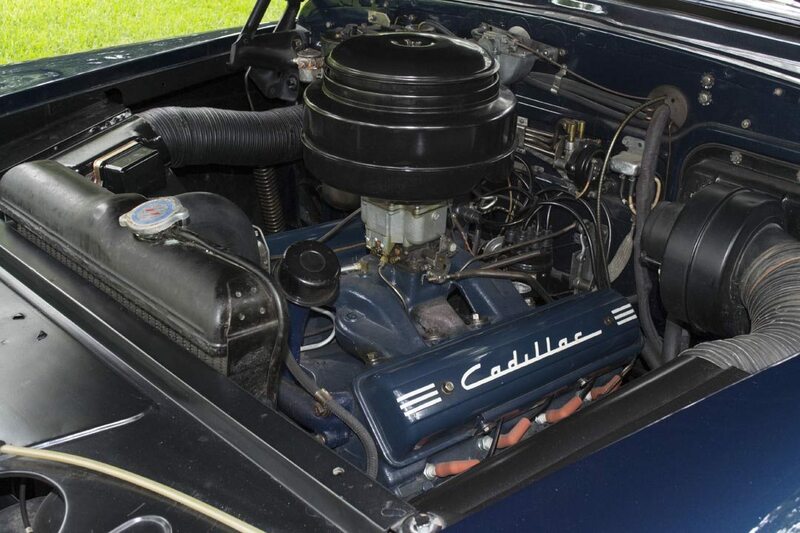 The clean and correct 331 ci overhead valve V-8 looks like jewelry with the sleek Cadillac valve covers, and mated to the 4 speed Hydra-matic transmission, this big comfortable drop top drives just like a modern car with all new brakes, exhaust, and suspension. It rides on new Coker Classic wide white wall radial tires and stunning full chrome wheel covers. The combination of style, comfort and convenience of this fine Convertible Coupe makes it the perfect touring car for any event.